"By investing in the education and development of youth in Qatar, INJAZ is driving forward the realization of Qatar’s National Vision 2030,” says Emad Al Khaja, CEO of INJAZ Qatar. “Since its inception in 2007 INJAZ has empowered young people by giving them the right track to succeed in a global economy and by helping shape the entrepreneurial landscape in Qatar." Qatar, focused on the National Vision 2030, aims to achieve a sustainable economic and societal growth, in addition to the creation of a well-educated, highly valued community by focusing on the four pillars of Economic, Human, Social and Environmental Developments. For this reason, INJAZ Qatar acts as a bridge that connects corporates to the country’s aims, by introducing programs focusing on work-readiness, entrepreneurship and financial literacy and letting companies participate as sponsors and volunteers in delivering these programs to the students. As a result, INJAZ Qatar offers experiential, hands-on programs in preparatory schools, high schools, universities and youth centers across Qatar. “INJAZ Qatar stakeholders are our success, which includes the work of the board members, corporate volunteers, schools, employees, and of course, the students. The contribution of these stakeholders in delivering successful programs to students is what has led to INJAZ Qatar’s success; students of INJAZ are provided with unique opportunities such as establishing and running a real company giving them valuable hands on experience in a safe, learning environment. This practical training and mentoring provided by local business leaders has made our courses extremely popular among young entrepreneurs and the next generation of business leaders,” adds Al Khaja. The CEO highlights the importance of the Mubadara 2015 Annual Young Entrepreneur of the Year Competition as INJAZ Qatar’s most interactive and popular education program through which student enterprises are established through Junior Achievement’s globally recognized “Company Program,” a prominent feature of the INJAZ Qatar calendar of activities. During the program, students go through the entire lifecycle of a startup venture as they develop a business idea, form a team, raise capital of up to QAR 11,000, devise business plans, and produce and sell a product or a service. Towards the end of the four months of activity, students present their entrepreneurial ideas before a judging panel of business leaders from the local market and winners are announced during the Mubadara annual ceremony. 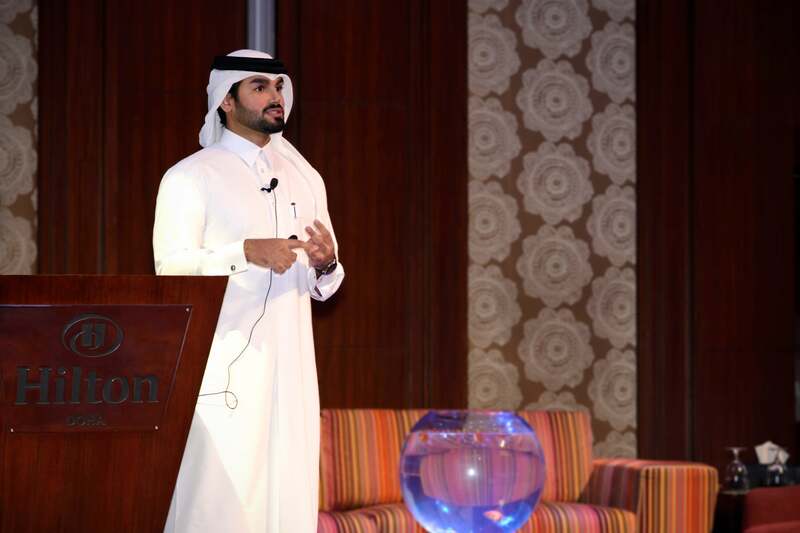 “INJAZ Qatar inspires and prepares the youth to be leaders and compete in a global economy. 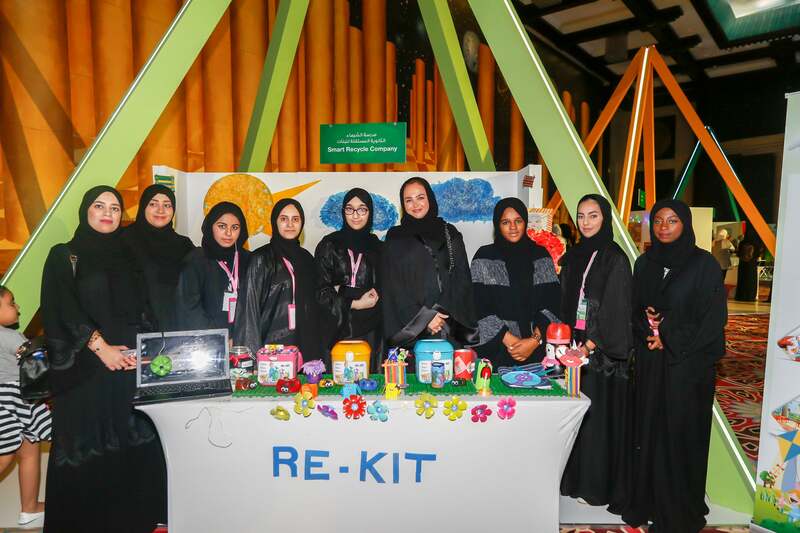 The competition is an opportunity for students to experience real life business applications, develop an enterprise and present actual business plans and prototypes of their offered products or services,” says Al Khaja. 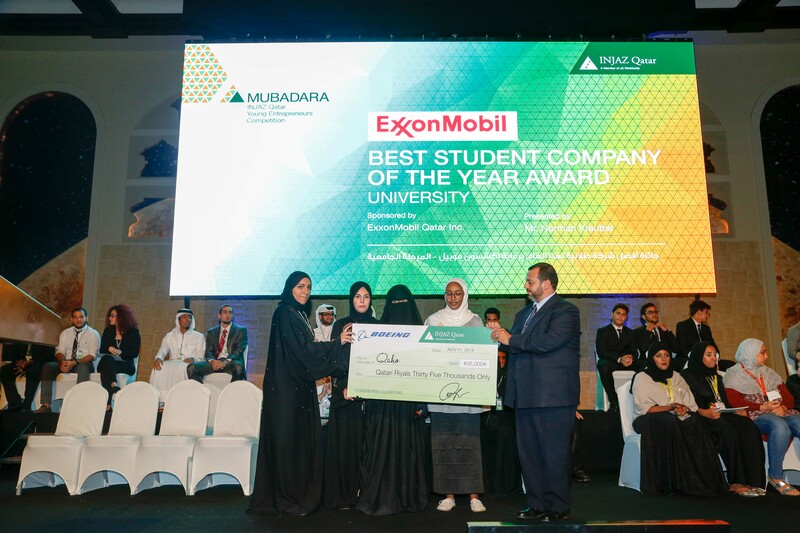 Open to students at the university, college and secondary school levels between the ages of 15-24, and in total, 18 student teams participated in the 2015 Mubadara program where they were provided with the unique opportunity to establish and run a real business over a period of four months with the guidance of professionals from leading businesses within Qatar. Out of the 18 student teams, 11 graduated to the final stage of the program, seven student teams from Qatar’s independent secondary schools and four teams from Doha universities. The “Best Company of the Year” award was presented to team Qaho from Qatar University and team Save Your Self from Al Resala Independent School for Girls. In addition, high school teams were recognized in a series of category awards including: “Most Innovative Product or Service” award won by team E Order from Ahmed Bin Mohammed AlThani Independent School for Boys; while team Smart Recycle from Al-Shaimaa Independent School for Girls received the “Best Marketing Plan” award; team Re-glass of Tareq Bin Ziad Independent School for Boys was awarded the “Best Social Impact” award; team Do Something Different from Al-Kawthar Independent School for Girls received the “Best Public Presentation” award, team The Echo of Al-Wakra Independent School for Boys received the “Best Annual Report” award, and team Gas Detection Service from Mosab Bin Omer Independent School for Boys was awarded the “Best Booth Display” award. Student teams competing at the university level were recognized in the following awards: Q-cycle from Qatar University received the “Most Innovative Product/ Service” and the “Best Social Impact” award, and Ptactica from Qatar University received the “Best Marketing Plan” award. For the purposes of the competition, students are required to produce and sell their product or service, and then prepare for the four stages including the annual report, the trade fair, the public presentation, and the panel interview. “INJAZ Qatar has been running the Company Program for eight consecutive years; we believe that these competitions are really beneficial to our students and fun at the same time. In addition, it’s a great opportunity to recognize our partners, get our board members more engaged, thank and appreciate our volunteers and that will promote the concept of volunteering and encourage the event attendees to volunteer with INJAZ,” says Al Khaja. Mubadara places INJAZ as one of the top and essential entrepreneurial organizations working to create and enhance the entrepreneurship ecosystem in Qatar. “We will continue to build on our achievements from previous years and continue to enhance our relationships with our current partners and seek to collaborate with new organizations, companies, educational institutions and sign MoUs with new entities. We have many projects for the coming year. We are working under the supervision of the Ministry of Education and Higher Education and willing to strengthen this collaboration." "We are working on developing a new program under the financial literacy pillar in collaboration with Qatar Exchange (QE) for the first time in Qatar. The program will be focusing on stock markets and will be developed by INJAZ Qatar and QE team along with education professionals,” explains Al Khaja. INJAZ Qatar also has plans to raise the bar for their Entrepreneurship Programs this year, and to conduct tailored workshops for the Company Program participation teams in several fields including marketing, financial management and presentation skills to boost the level of the contestants. These workshops aim to introduce new skills and expand participant knowledge, hence raising the quality and making the competition more challenging. The mission of INJAZ Qatar is to accelerate young people’s ability to contribute to the economic development of nations by connecting them with dedicated business mentors and providing them with the skills, and mindset they need to become the entrepreneurs and business leaders stimulating their communities. “Our vision is to inspire and prepare a generation of youth in Qatar to use their natural talents, inspiration, passion and determination to become the business leaders and entrepreneurs of tomorrow who empower their community,” adds Al Khaja. MetFame was the result of the 2014 Company Program, established by two passionate winners of Mubadara 2014. MetFame is the first Qatari media company to specialize in the creation of engaging social media videos for businesses, and offer a range of video types including stop motion, sketch, and animation. “MetFame is considered one of INJAZ Qatar’s most successful stories to date; it makes INJAZ feel proud and accomplished to see the experience that these girls gained from the program,” says Al Khaja. Through the Work Readiness Program, Job Shadow Day (JSD) allows students an opportunity to shadow an employee at a partner company later leading to possible internship placement. Abdulrazzak Mohamed, a student studying accounting at Qatar University, participated in JSD at Deloitte and was later offered an internship that transitioned into Abdulrazak working on a full-time basis at Deloitte’s Tax Department. A similar story occurred with Rabie Al Tork, who later joined Abu Isa Holding as an IT officer. Students compete against each other at four different stages of the competition where they will be scored by the judges on several criteria at each stage. The judges will deliberate and the company with the highest score will win. STAGE 1 WRITTEN FINAL COMPANY REPORT The Company Report is the opportunity to summarize the team’s year in business. It is an important record of what they have achieved. It includes name, logo, mission, vision, and business plan of each department, liquidation report. This segment carries 15% of the weight of the final grade. STAGE 2 TRADE FAIR STAND/BOOTH VISITS This is the first opportunity where the team will have to talk to the judging panel in person, answer their questions and market their product. This segment carries 20% of the final grade. In this stage, students must sell the audience their product. Marketing the product /service is the most important aspect of this segment. Students will try to convince people and judges to buy something from them without being pushy. STAGE 3 PUBLIC PRESENTATION This segment is the teams’ chance to present and pitch their companies to potential investors; this segment carries 25% of the total final grade. Students should use the public presentation to market and sell their company rather than their product to a possible investor in the audience; however, the product/service must be made clear during the presentation. STAGE 4 PANEL INTERVIEW This is a very important aspect of the competition since the judges have the opportunity to ask any questions regarding the company as well as clear any queries they may have after having read the reports and visited the stands. This segment has a heavier weight than the three other segments, as it carries 40% of the final grade. Judges are likely to probe company members on their understanding of how and why the company performed as it did and what general lessons the students are able to draw from this, and how these lessons might be applied in a new business context. Company members without their volunteer or teachers will be questioned by the panel of judges for a maximum of 15 minutes about different aspects of their company.